Getting ready for the year-end holidays, I decided to pickle a new batch of grapes with a cinnamon stick and simple syrup made of sugar and vinegar. 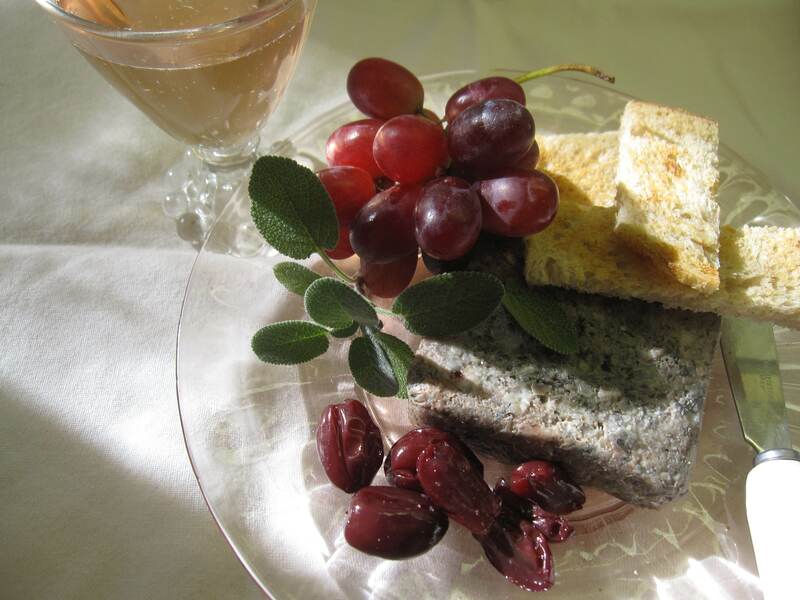 Brilliantly easy, provocatively mysterious yet delicious, the grapes can be served with pâté, meats and poultry, and probably with a root vegetable terrine of some sort. They’re addictive, so make lots. They can be ready in a matter or days or kept in a tightly sealed jar in a dark place for months. The cured batch illustrated here hailed from last spring, and while the skins are a little tough, the flavor is extraordinary. And so is the liquid as the base for a type of vinegar-based drink called a “shrub.” A double treat. The source of the recipe cracks me up. In 1986, the famous food writer M.F.K. Fisher annotated a 1967 edition of Catherine Plagemann’s cookbook Fine Preserving, and the marginalia are as charming as the original recipes and their stories. This one in particular is a real period piece. First, Fisher declares that this is one of her favorite recipes in the book and then goes on in her slightly feisty way to take it apart and reconstruct it, leaving out the onion saying, “I don’t think it adds anything.” She uncharacteristically doesn’t pick up on an amusing mistake Plagemann makes about Moroccan food (which I’ll write about sometime), and describes the hot syrup as “really a kind of bar-mix, called ‘simple syrup,’ I think.” I love it. Using Fisher’s take on the recipe, this couldn’t be simpler to make. 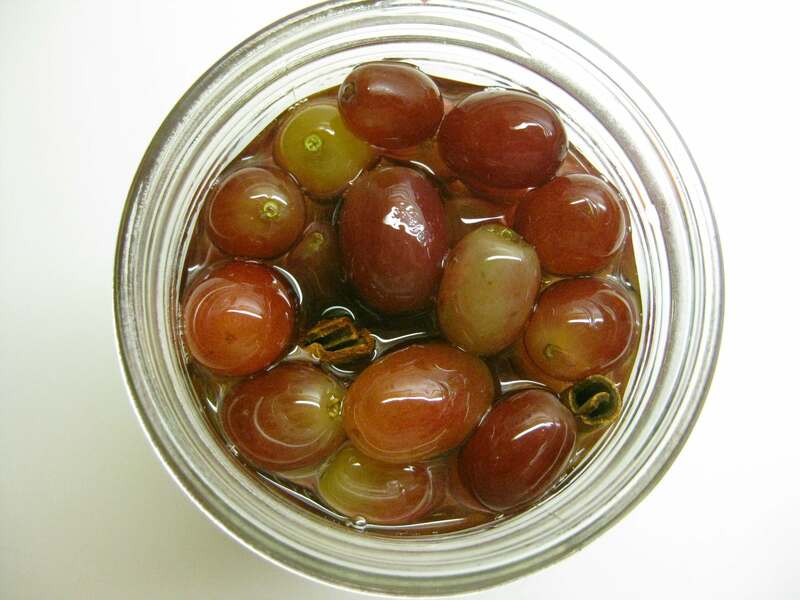 Place washed and thoroughly dried grapes in a container with a tight lid. Insert a cinnamon stick. Simmer sugar and white vinegar (or white wine vinegar) for five minutes, pour the hot liquid over the grapes, seal the jar and set aside in a dark cupboard for a week to several months. Plagemann claims the grapes are ready in a day, but they’re just barely coated by then. Fisher says to use them after a month, and I agree, since by then they’re well infused with the spiced syrup and the skins of the grapes haven’t hardened too much. They’ll be perfect by Christmas. By the way, don’t throw out the liquid from the pickled grapes. It makes a terrific drink with added seltzer water. A drink made with a fruit base that includes vinegar and sugar is called a shrub and makes a refreshing beverage. Characteristically, I also re-used the cinnamon stick since it still was potent, adding it to a pan of oven-roasted baby garnet yams and garlic. Place the grapes in a very clean pint jar that has a tight lid. Bring the sugar and vinegar to a boil, lower the heat and simmer for 5 minutes, stirring to dissolve the sugar. 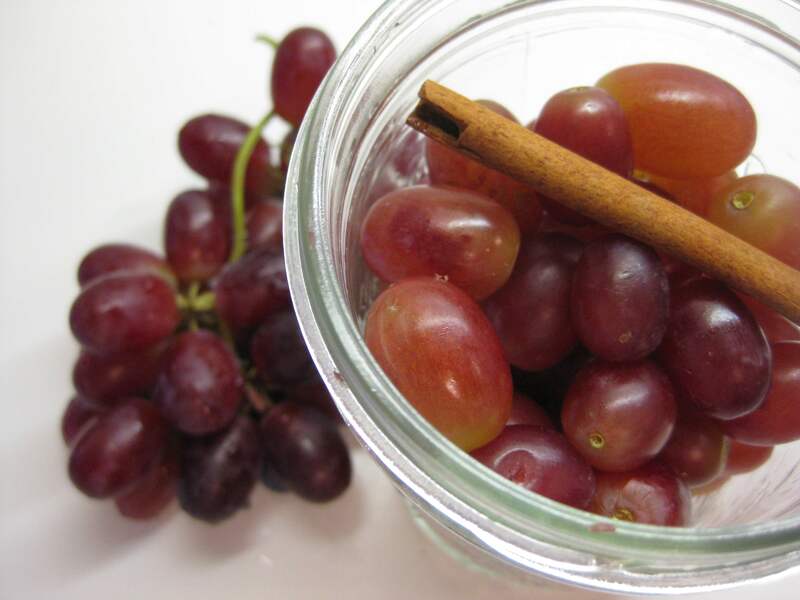 Pour over the grapes and insert the cinnamon stick in the jar. Use a skewer or chopstick to release any air bubbles. Cap tightly and store in a dark cupboard for a month before using. Variation: Plagemann added minced onion to hers and Fisher omitted it. I am going to make a batch with halved rings of red onion and white wine vinegar to see how it varies the outcome.